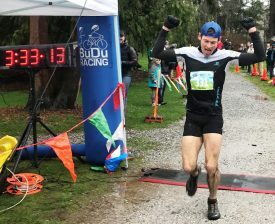 In spite of less-than-ideal weather conditions, both Max King and Hayden Hawks went under King’s 3:35:42 course record set in 2014, on Saturday, March 18, at the 25th running of the Chuckanut 50K in Bellingham, WA. The 37-year-old Bend, Oregon resident clocked a stellar performance of 3:33:11 with Hawks, 26, St. George, UT, finishing just 31 seconds later. In third, Sage Canaday,31, Boulder, CO, in his second Chuckanut appearance (2012 was his first Chuckanut and debut at the ultra-distance), rounded out the top three with a time of 3:40:28. Whereas the top men were all experienced at the ultra distance, three of the top five women were debuting at the 50K including winner Ladia Albertson-Junkans. The 31-year-old from Seattle admitted being a little nervous about the distance prior to the event, but she raced to a solid victory in 4:17:44, finishing 21st overall. Finishing second was YiOu Wang, 31, San Anselmo, CA, timed in of 4:23:31, who, unlike Albertson-Junkans, had never run on the trails at Chuckanut, but has raced many times at the ultra distance. In third place, debuting at the 50K, was 41-year-old Rachel Jaten, Spokane, who posted a time of 4:33:13. In fourth was early race leader Camille Herron, 35, Warr Acres, OK, who finished in 4:37:14, followed by Bellingham’s Maria Dalzot, 28, who in her debut at the distance, finished in 4:43:42. A total of $4500 in prize money was distributed to podium finishers and the top male and female masters’ runners. 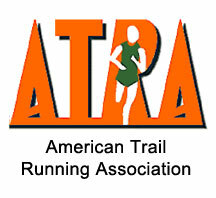 The race also served as the final selection race for the 2017 US Trail Team. Both King and Albertson-Junkans earned automatic spots on Team USA for the 2017 IAU/ITRA Trail Championships on June 10, in Italy. For a full story along with athlete quotes, visit this link: http://trailrunner.com/trail-news/max-king-ladia-albertson-junkans-win-chuckanut-50k/. Results for the 411 finishers can be found on the BuDu Racing website.